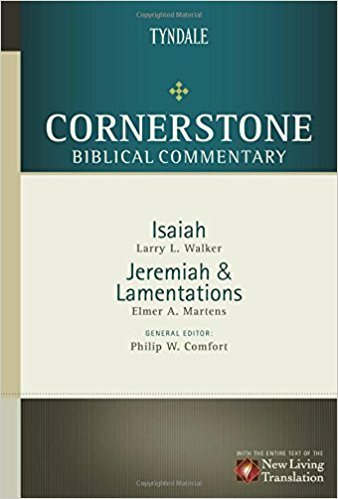 The Cornerstone Biblical Commentary series is the product of nearly 40 scholars, many of whom participated in the creation of the NLT. The contributors to this series, who are well-known and represent a wide spectrum of theological positions within the evangelical community, have built each volume to help pastors, teachers, and students of the Bible understand every thought contained in the Bible. In short, this will be one of the premier resources for those seeking an accessible but fairly high-level discussion of scriptural interpretation. Elmer A. Martens, PhD, is professor emeritus of Old Testament and president emeritus at Mennonite Brethren Biblical Seminary (Fresno, California), where he has taught for over 30 years. He is the author of God's Design, A Focus on Old Testament Theology, and a commentary on Jeremiah (Herald Press). He was coeditor of The Flowering of Old Testament Theology and served for several years as the editor of the journal Direction. Larry L. Walker, PhD, held a professional teaching career with time split between Southwestern Baptist Theological Seminary and Mid-America Baptist Seminary. Since his retirement in 1998, he has done adjunct teaching at several seminaries. He authored a commentary on Zephaniah for the Expositor's Bible Commentary and is also a contributor to the New International Dictionary of Old Testament Theology and Exegesis.